Gianluigi Buffon demonstrated in the Champions League final last Saturday that age needn’t be an impediment to high-level performances by a goalkeeper. And as the rumour mill turns on the future of David de Gea, the debate intensifies around what price Manchester United will persuade Real Madrid to pay, and who can step into the young Spaniard’s shoes at Old Trafford. So who are the best goalkeepers in Europe, objectively speaking? An attempt to answer that in this piece of statistical analysis throws up some interesting possibilities, based on a ‘Safe Hands’ rating (SHR) that considers the measurable parts of a goalkeeper’s job. 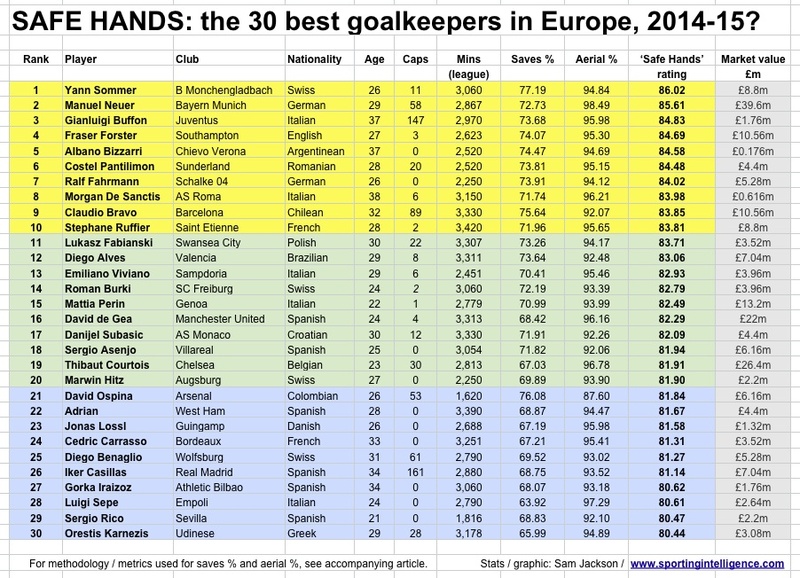 Based on a single league season, and therefore asking solely who has been the best goalkeeper of 2014-15, Buffon is up there, lying third in a list of the top 30 custodians across Europe’s ‘Big 5’ leagues. He has an SHR of 84.83 (out of a possible 100). The methodology is explained in detail below. You can also get all the background data in a spreadsheet here. One place above Juventus’s 147-times capped Italian is Germany’s Manuel Neuer of Bayern Munich, with an SHR of 85.61. And above them both is Yann Sommer, the 26-year-old Swiss ‘keeper who has just completed his first season of a five-year deal with Borussia Mönchengladbach of the Bundesliga. His SHR is 86.02. The best-rated goalkeeper in the Premier League in 2014-15 was not De Gea on this analysis; although it should be stressed this analysis includes only league matches. Southampton’s Fraser Forster comes out as the top ‘keeper in England’s top division (SHR: 84.69). Costel Pantilimon of Sunderland was next best in the Premier League, then Lukasz Fabianski of Swansea and then De Gea. We’ll go into detail in a moment, but first here are the top 30, detailing their clubs, nationalities, ages, caps, league minutes played in 2014-15, their save percentage rate, their aerial percentage rate, their SHR and a market value. (Don’t get too distracted by the market values. These happen to be taken from Transfermarkt. They are at best a benchmark of value. Other values are available, all also flawed in some way. The key thing is they are consistent in source). This analysis, in as much as it reduces each player to a single number in order to allow objective comparison, attempts to reprise the pioneering use of stats as used by the Oakland Athletics baseball team in the early Noughties. The ‘Moneyball philosophy,’ as this became known, led the Oakland A’s to break the record for consecutive Major League Baseball victories, with a streak of 20 wins recorded by the team despite their tiny budget. Whilst baseball is perhaps the ideal sport for using statistics in player recruitment, with the game little more than a series of set pieces with relatively few variables at stake, the comparably fluid nature of football doesn’t easily lend itself to the objective analysis of individual players. Almost any action that a footballer performs during a game is hugely reliant on the player’s team-mates in order for it to be considered effective or not. A defence-splitting pass, for example, won’t ever be an assist if the receiving player balloons the ball over the bar or never makes the run into a good pass receiving position in the first place. The passer themselves would never be able to deliver the killer ball were it not for the off-the-ball movements of their other team-mates which may drag the defence away and create the space in which said pass may be played. Indeed, football matches ebb and flow with a huge degree of interrelatedness among the players, with set pieces at which the variables may be reduced fairly infrequent. For the position of goalkeeper, however, the irksome task of quantifying individual performances is dramatically eased. A solid 50 per cent of a goalkeeper’s four main responsibilities – making saves, claiming crosses, organising the defence and distribution – are fairly easily quantifiable, and those are the first two: saves and crosses. It is probably impossible to objectively assess the defensive organisational skills of a goalkeeper because the whole team, and particularly the back four, are accountable for a team’s defending, whilst any serious attempt at determining whether a distributive throw or a kick has been ‘good’ or not relies to a degree upon the heading and positional prowess of a goalkeeper’s outfield team-mates. As far as shot-stopping and cross collection are concerned, however, the issues are fewer and further between. It turns out to be actually quite easy to compare goalkeepers based upon the proportion of saves they make for every shot they face, and upon the proportion of crosses that they successfully catch. The model used here also factors in punches, rating them worse than a catch but better than a failed claim. The total amount of shots that a goalkeeper will face is hugely dependent upon the standard of defending by their team-mates, which is why a simple tally of clean sheets is not useful to assess goalkeepers. That measurement favours goalkeepers who have good defenders in front of them, and who play a lot of matches. Clean sheets lead one to consider a goalkeeper excellent if his defenders have prevented the opposition’s strikers from having any decent shots, whereas the goalkeeper who makes a string of saves before conceding a goal about which he could do little owing to the porous nature of the back four in front of him goes unrecognised. Counting the percentage of shots that a goalkeeper saves, however, serves to negate these issues, with that percentage being the proportion of saved shots of all shots. If a goalkeeper makes 60 saves in a season and concedes 40 goals, his save percentage is 60%, or 60 of 100. In the sports analytics community using a ‘Save %’ metric is not without controversy. There is an excellent in-depth read on that here by Colin Trainor which considers the repeatability of shot-saving performances. Goalkeepers have to deal with huge variety in the difficulty of the shots that they face, and their statistics one year are not necessarily reliable for forecasting how they will perform the next. But other analysts have demonstrated that over long periods of time, when the sample size is balanced out, certain goalkeepers do indeed appear to consistently save more shots than do others. There is a piece on that here by Paul Riley, which in turn references interesting work by Dan Kennett. The ‘Save %’ metric is a decent measure by which goalkeepers shot-stopping may be objectively compared, provided the sample size of shots faced is big enough. As far as this analysis is concerned, to improve the reliability of the comparisons, only goalkeepers that played a minimum of 15 full league matches (or 1,350 minutes) over the course of the 2014-15 season have been be considered. All the base data has been collated from Squawka. For the aerial proficiency of a goalkeeper, we have used a combination of cross collection success (a percentage of success rate of attempts made) and factored in the number of punches used by each goalkeeper, with the particular application of the punch metric being the only subjective element of the analysis. There are, of course, two ways to analyse a punch: that it is good goalkeeping, or bad goalkeeping. And that in turn might depend on the outcome of the punch. But generally most people would agree that a goalkeeper punching a catchable cross is introducing an unnecessary element of danger; the ball may drop to an opposing player. Collecting the ball is clearly better. Then again a punch may be considered ‘good’ in a situation in which a catch is not possible, but the goalkeeper still manages to alleviate a degree of the pressure upon their penalty box. In order to factor this into the analysis, a punch by a ‘keeper has been rated as better than coming to claim a ball and failing. The proportion of balls punched by each keeper have been divided by three before being subtracted from the a goalkeeper’s ‘Claim %’ figure. A high ‘Punch percentage’ is thus taken to be a ‘bad’ thing, on the basis that all things being equal, no goalkeeper should be electing to punch a ball much more often than any other goalkeeper. But the analysis recognises that punching is of less importance than the ‘Claim %.’ Again, for those wanting to drill down into the numbers, get the full data in the spreadsheet here. The Save % and Aerial % are averaged to produce the SHR, so-called for being a measurement of the main things a goalkeeper primarily does with his hands hands. By boiling a goalkeeper’s season down to one number, the metric enables individual goalkeepers to be compared on both their shot-stopping and aerial prowess in one fell swoop, with the proficiency, or lack thereof, of the defenders in front of them removed from the equation. The full data in the spreadsheet contains league by league details for each goalkeeper and various tables including the summary here (click to enlarge). There is no surprise that Neuer and Buffon are at the top end of the SHR table, but what of their market values? As mentioned previously, these can be but a debatable benchmark. Other value calculators are available, including the one linked here from the CIES Observatory, who have this week published their own fascinating report about the ‘objective’ values of players across the ‘Big 5′ leagues (in all positions). That report is accessible here (Monthly Report, Issue 6). The miniscule market values of Buffon, Albano Bizzarri of Chievo and Morgan De Sanctis of Roma are probably most attributable to their lofty ages rather than being a fair reflection of their goalkeeping abilities. And De Gea? There are reports that United want at least £30m for him, and perhaps more. Transfermarkt rate him at around £22m and the Football Observatory at closer to €22m. These figures are so (relatively) low for a good young goalkeeper because within months, if he does not move this summer, De Gea will be eligible to start negotiating a free move elsewhere. His contract at Old Trafford expires in a year. But let’s forget the precise value he may attract, which will always come down a negotiation and what two clubs are prepared to trade for. The statistics are at the very least suggestive that United should be able to not only turn a profit on De Gea, for whom they paid around £18m in 2011, but also find a statistically better replacement at a much lower cost. Whether or not that is Sommer, bought by Mönchengladbach to replace the Barcelona-bound Marc-Andre ter-Stegen, remains to be seen, as is whether Sommer goes on to win the long-term acclaim Neuer has earned. It was, however, Sommer and not Neuer who was voted into the German broadcaster ARD’s Bundesliga team of the season thus adding subjective clout to the Swiss’s statistics, with Sommer’s market value making him an eminently attractive prospect in addition to his incredible shot-stopping statistics. In the Premier League, meanwhile, three goalkeepers turned in better statistics than did de Gea, with Southampton’s Forster and Sunderland’s Pantilimon possibly hamstrung in their pursuit of the No1 spot in pundits’ teams of the season owing to the duo having played fewer minutes than the Spaniard. Indeed, Forster would perhaps be seen as a good replacement for De Gea had his season not come to an abrupt end in March thanks to injury. Pantilimon, meanwhile, seized the Sunderland gloves from Vito Mannone following the Black Cats’ 8-0 capitulation at the hands of Forster’s team in October and never looked back, with the 6 ft 8 Romanian not only a towering presence in his penalty area, but also managing to save an impressive 73.8% of the shots aimed at his goal. His is no doubt an unfashionable suggestion for a transfer to Manchester United, and one that realistically will not happen but his season was statistically stellar. Lukasz Fabianski, meanwhile, just missed out on the European Top 10 by less than 1/10th of a ‘Safe Hands’ point, but he too had a season statistically better than de Gea, and, valued as he is at a relatively meagre £3.52m, the Pole would appear to be a real bargain. In the other leagues of Europe, there are yet more goalkeepers at whom United, and many other clubs for that matter, would do well to take a long look at with Ralf Fahrmann and Stephane Ruffier of Schalke and St-Ettienne respectively appearing to be statistically sound prospects. Alongside Fabianski in the rest of the Top 20, meanwhile, there are yet more bargains to be found. Diego Alves has the distinction of being, alongside his impressive shot-stopping and aerial safety statistics, a penalty saving specialist – a real boon for those teams with aspirations of making the latter stages of the Champions League, for example. Freiburg’s Roman Burki is also noteworthy as a transfer target for Europe’s top clubs after a season which saw Freiburg relegated to the second tier of German football. With a market value of less than £4m and a good decade of goalkeeping likely ahead of him, Burki would no doubt welcome a move back into the top flight of European football and seems a far better value-for-money youth prospect than Genoa’s highly rated Mattia Perin. Although Perin’s heady market value is supported by the statistics that point to him having a very safe pair of hands, it is questionable whether he is really worth more than four times as much as Burki. Whilst Villareal’s Sergio Asenjo appears to be yet another relatively youthful prospect with a reasonable market value, there are older players such as Danijel Subasic and the likes of Fabianski should certainly not be discounted from anyone’s radar. With two of Europe’s top five aged 37 it seems that, as far as goalkeepers are concerned, a false premium may be being applied to young talent. Whilst Thibaut Courtois, De Gea and Perin are all under 25 they are the 2nd, 3rd and 4th most highly valued goalkeepers within the top 20. With Buffon, Bizzarri and De Sanctis all having apparently had better seasons than the youthful trio despite the rapid approach of the Italians’ fortieth birthdays, it would be folly for a team to look only at young talent. ‘An epidemic failure’ was how Peter Brand, Jonah Hill’s character in Moneyball, described conventional attempts within baseball to understand what was happening on the pitch. It seems that the same sentiment could also be applied to swathes of European goalkeepers, with many statistically stellar seasons having been turned in by a number of goalkeepers well below the radar. Yann Sommer is, at first glance, perhaps a surprising man to be found topping the ‘Safe Hands’ metric of Europe’s best goalkeepers. The Swiss was signed by Borussia Monchengladbach from FC Basel in July 2014 as a direct replacement for the Barcelona-bound Marc-Andre ter Stegen, and, with a season of data to hand for hindsight, Monchengladbach appear to have got themselves a fantastic deal with Sommer’s transfer fee of £7m more than £10m less than the £17.6m that ter Stegen was allowed to depart the club for. In a season which saw Monchengladbach finish third in the Bundesliga and thus qualify for the Champions League, Sommer’s ‘Saves %’ stat was particularly impressive. The 26-year-old’s saving of 77.2% of the 114 shots thrown at him in 3,060 minutes of Bundesliga action put him a massive 1.1% ahead of Europe’s next best goalkeeper as far as saves are concerned, Arsenal’s David Ospina, whose ‘Saves %’ stood at 76.1%. Sommer’s ‘Aerial Safety’ is still fairly impressive, with his score of 94.8% placing him fifth in the Bundesliga after he dropped just one of the 115 crosses that he attempted to catch with his ‘Punch %’ of 12.9% certainly respectable. As conventional wisdom would have it, Manuel Neuer is the planet’s best goalkeeper. The 29-year-old German has held down the number 1 spot in the FIFPro World XI since 2013, came third in the 2014 Ballon d’Or, and was the recipient of the Golden Gloves award at the 2014 World Cup. Transfermarkt have accordingly awarded Neuer the highest market valuation of any goalkeeper, with his value of £39.6m in excess of £13m more than the goalkeeper with the next highest value, Chelsea’s Thibaut Courtois. The statistics for the 2014-15 season, however, place Neuer behind Sommer as far as the ‘Safe Hands’ metric is concerned, with the Bayern Munich goalkeeper’s ‘Saves %’ of 72.7% placing him only third in the Bundesliga behind both Sommer and Schalke’s Ralf Fahrmann. Neuer’s ‘Aerial Safety’ metric of 98.5% is, however, enormously impressive, with him having successfully claimed all 63 of the crosses he attempted to catch, whilst having elected to punch only 4.6% of the balls he made an effort to deal with. The veteran Italian commanded, in 2001, what remains to this day the most expensive transfer fee ever paid for a goalkeeper when Juventus paid Parma £33m for his services. Buffon went on to be nominated as the resident goalkeeper in the FIFPro World XI in 2006 and 2007, but, despite his now 37 years of age, the Italian appears to be showing no sign of slowing. With his current Juventus contract not expiring until 2017, and with him having stated his desire to play in a record-breaking sixth World Cup in 2018, the statistics are firmly on his side. Able to boast the eighth best ‘Saves %’ of all the goalkeepers in the Top 5 European leagues this season having conceded just 56 of the 76 shots thrown in his direction, Buffon weighs in at a similarly heady seventh as far as ‘Aerial Safety’ is concerned, with Buffon this season having spilt just one cross in Serie A alongside a ‘Punch %’ of 8.8%. With his low market value of £1.76m explained by his age, with footballers commonly held to enter a rapid decline soon after their thirtieth birthdays to the extent that the CIES Football Observatory simply refuse to calculate transfer values for players over the age of 33, it would appear that any present held sentiment suggesting Buffon to be past it would wildly miss the mark. Despite the platitudes heaped on David de Gea’s 2014-15 season in the Manchester United goal, there are still three men who recorded a better ‘Safe Hands’ score in the Premier League than the Spaniard. Southampton’s Fraser Forster appears at the head of this trio, with the 27-year-old weighing in with the fourth highest ‘Safe Hands’ score in Europe’s Top 5 leagues. In the 2,623 minutes of Premier League football that Forster performed until suffering a knee injury against Burnley in March that will see him sidelined for the best part of a year, Forster recorded a ‘Saves %’ of over 74% that was beaten by only Sommer, Ospina, Claudio Bravo and Albano Bizzarri in Europe. Forster’s ‘Aerial Safety’ score of 95.3%, meanwhile, was comprised of just one failed claim and a punch rate of 11% that saw him place third behind only Courtois, Asmir Begovic and de Gea in the Premier League for aerial security. Sunderland’s giant Romanian goalkeeper is probably the value player in the Top 10. Whilst Buffon, Bizzarri and Morgan De Sanctis are all valued at a few million less than Pantilimon, the valuation of this trio is down to the fact that, despite their stellar seasons, they are all almost certainly in the twilight years of their careers as elite footballers. Pantilimon, meanwhile, as a comparably fresh-faced 28 year old has years left to play at the top level, with his market value of £4.4 million exactly half that of Sommer despite having a ‘Safe Hands’ rating just 1.52 less than the Swiss. In the 2,520 minutes of Premier League football played by Pantilimon since replacing Vito Mannone as Sunderland’s goalkeeper of choice in the aftermath of the Black Cats’ 8-0 demolition at the hands of Southampton back in October, Pantilimon recorded ‘Saves %’ and ‘Aerial Safety’ scores a tiny amount less than the significantly more highly valued Forster. Whilst Forster saved 74.1% of the shots he faced, Pantilimon saved 73.8%, with their ‘Aerial Safety’ percentages weighing in at 95.3% and 95.2% respectively. Despite playing more than 600 minutes fewer than Lukasz Fabianski, Adrian and Rob Green, Pantilimon claimed the fourth most crosses in the Premier League, with only two of his 100 attempts dropped. His ‘Punch %’, meanwhile, was a mere 9.1%, the fourth lowest in the league. The first thing to note about David de Gea is his impressive ‘Aerial Safety’, with his score of 96.159% – derived from a season in which he spilt just one cross and punched only 7.9% of the time – rendering him the eighth best goalkeeper in the air in Europe’s top 5 leagues, with only Neuer, De Sanctis and Courtois aerially safer of those within the Top 20 of the ‘Safe Hands’ metric. Any ambitions that de Gea may have held regarding a higher placing in the ‘Safe Hands’ metric were, however, somewhat let down by his relatively poor ‘Saves %.’ The Manchester United goalkeeper’s score of just 68.4% saw him concede 36 goals from the 114 shots aimed in his direction, making him statistically only the Premier League’s seventh best shot-stopper in 2014/15. Despite this, make no mistake, de Gea’s hands were still in all statistically safe enough over the course of the season to place him ahead of 85% of the goalkeepers in Europe’s top 5 leagues. The extent of the praise to have been heaped upon him, however, appears to have been somewhat excessive with de Gea’s market value of £22m appearing to be steep indeed for Europe’s 16th safest pair of hands. Essentially everything that has just been said for de Gea rings equally true for Chelsea’s goalkeeper. 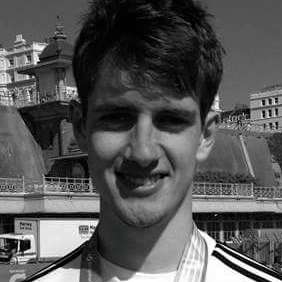 Having amassed 29 international caps by the age of just 23, Thibaut Courtois has, for a while, been a very highly rated goalkeeper. His first season at Stamford Bridge after 111 loan appearances for Atletico Madrid, however, was only good enough to place him 19th in the ranking of the goalkeepers of Europe’s Top 5 leagues as far as the ‘Safe Hands’ metric is concerned. Whilst this is still impressive, it is perhaps not what may be expected from a player valued at £26.4m that sees him rank behind only Manuel Neuer in the list of goalkeepers by market value. Alike de Gea, meanwhile, Courtois also impressed in ‘Aerial Safety’ before falling somewhat short as far as ‘Saves %’ is concerned. Ranking first in the Premier League and fourth in Europe behind only Neuer, Empoli’s Luigi Sepe and Metz’s Johann Carrasso with a score of 96.8% obtained from dropping not one attempted catch, and punching only 9.7% of the balls he made an effort to deal with, Courtois plummets to a firmly mid-table ranking for ‘Saves %’ with his 67% success rate derived from 91 shots in his direction only good enough to render him the Premier League’s eight best shot-stopper.